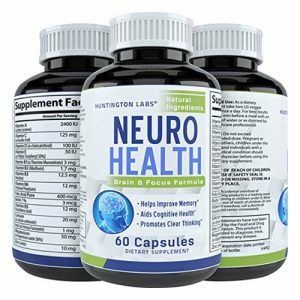 Neuro Health is a mind-enhancing supplement made from natural extracts of green tea by Huntington Labs and it was a best-selling herbal supplement for brain empowerment. It is known as an effective supplement for increasing a person’s memory power and enhancing their ability to perform better as an intellect. It helps them to focus and concentrate better on their tasks in an organic way and this is also very effective in improving one’s blood pressure and cerebral blood flow by being a neuroprotective supplement. Green tea extracts are known as mood and attitude lifter and this is exactly what Neuro Health also does to its consumer. Huntington Labs was initially founded in 1992 just as a producer of infection control chemicals and later I was acquired by Ecolab in 1996 and started working in more branches such and germicides, sterilants, etc. and with time became one of the leading manufacturers and marketer of germicides, disinfectants, surgical scrubs, and sterilants. The company headquarter is located in Great Lakes, Midwestern US. They are now primarily serving in the US healthcare and educational janitorial markets through a vast number of sellers and distributors of a total of 165 members. They have also introduced a few supplements for fat burning, brain health, etc. Ingredients: Vitamin A (as Beta Carotene), Vitamin C (as Ascorbic Acid), Vitamin D (as cholecalciferol), Vitamin E (as dl Alpha Tocopheryl 50%), Vitamin B1 (as Thiamine Mononitrate), Vitamin B2 (Riboflavin), Vitamin B3 (Niacidine), Vitamin B6 (Pyridoxal Phosphate), Folic Acid Pure, Biotin 1%, Vitamin B5 (Pantothenic Acid), Calcium (as calcium carbonate), Iron (as Ferrous Fumarate), Magnesium (as magnesium oxide 58%), Zinc (oxide), Selenomethionine (Amino Acid Chelate 0.2%), Copper (Gluconate 13%), Manganese (Sulphate 20%), Chromium (Polynicotinate), Molybdenum (Amino Chelate), Potassium (Citrate 36%), and Proprietary Blend: DMAE Bitartrate, Glutamine, Glutamic Acid, Green Tea Extract, Bacopa Extract, Choline, N-Acetyl L-Tyrosine, Bilberry Fruit Extract, Grape Seed Extract, Grapefruit Seed Extract, Olive Leaf, Cinnamon Bark Extract, Licorice Root Extract, Boron, DHA, Vanadyl Sulfate, Phosphatidylserine, and Huperzine A. Other ingredients: Cellulose (vegetable Capsule), Rice Flour, Magnesium Stearate, and Silicon Dioxide. Neuro Health is a supplement made for improving an individual’s brain health from completely natural extracts of green tea by Huntington Labs which offers a person to do tasks with better focus, enhances an individual’s memory power and mind clarity towards things that is delivers by specifically and targeted composition of natural ingredients for a “nootropic” or “brain enhancer”. Specially chosen natural extracts of herbs and other natural substances to become one composite to work together to boost a person’s attention, making his brain think in a more creative and flexible manner and also enhances the memory and clarity of that individual. It also works to increase brain speed while performing different tasks. Neuro Health is made from Green Tea Extracts and they are traditionally known as a great supplement for mental performance by promoting better brain function in a natural manner. Extracted from “fir moss”, the Huperzine-A works as a booster of alertness of brain and enhances the memory of it. Bacosides are used to improve the cognitive function of the brain and it also works on the empowerment of memory and bacosides are a class of chemical compound which are obtained from “Bacopa Monnieri”. An essential amino acid namely L-Glutamine is used to builds protein and it also aids memory. Huntington Labs gave special attention in delivering all these benefits from all of the above mentioned natural nootropic brain boosters and hopes that it will let you have the experience of maximum benefits by taking the recommended daily dose. How Much Does Neuro Health Cost? Neuro Health is a little less expensive than other similar nutritional supplements. It highly not recommended to take exceeded doses. Not intended for pregnant women or to the children less than the age of 18. Stop taking the supplement and consult your doctor if any adverse reactions occur. Keep bottle tightly closed and store it in a cool and dry place. Where To Buy Neuro Health? Neuro Health can be ordered online from different places but our recommendation is to either buy it directly from the manufacturer or purchase it from trusted online retailers which may offer you discounts. We did a research on other products from Huntington Labs. Here is a complete list.